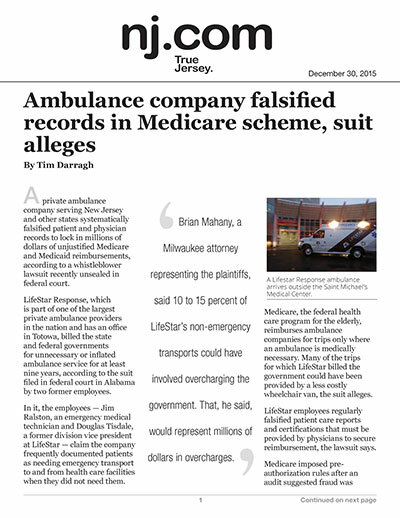 A private ambulance company serving New Jersey and other states systematically falsified patient and physician records to lock in millions of dollars of unjustified Medicare and Medicaid reimbursements, according to a whistleblower lawsuit recently unsealed in federal court. LifeStar Response, which is part of one of the largest private ambulance providers in the nation and has an office in Totowa, billed the state and federal governments for unnecessary or inflated ambulance service for at least nine years, according to the suit filed in federal court in Alabama by two former employees. In it, the employees — Jim Ralston, an emergency medical technician and Douglas Tisdale, a former division vice president at LifeStar — claim the company frequently documented patients as needing emergency transport to and from health care facilities when they did not need them. Medicare, the federal health care program for the elderly, reimburses ambulance companies for trips only where an ambulance is medically necessary. Many of the trips for which LifeStar billed the government could have been provided by a less costly wheelchair van, the suit alleges. LifeStar employees regularly falsified patient care reports and certifications that must be provided by physicians to secure reimbursement, the lawsuit says. In addition, the lawsuit says company officials urged EMTs to give oxygen, intravenous medicines and other services to patients who didn't need them, so that the company could bill Medicare at higher rates. It also says that Ralston and Tisdale witnessed employees fabricating records reporting treatment for services that were never provided. Their complaints about the alleged illegal overcharges went nowhere, it said. "Both Mr. Ralston and Mr. Tisdale knew they had to comply with these directives or they would lose their jobs," the suit says. Tisdale alleges he discussed his concerns in 2010 with Danny Platt, then-president of LifeStar. Platt allegedly said LifeStar needed to pump up its revenues to make it appear more profitable than it was to its eventual buyer, Falck, a Danish company. A Lifestar spokeswoman did not return calls Wednesday seeking comment. Brian Mahany, a Milwaukee attorney representing the plaintiffs, said 10 to 15 percent of LifeStar's non-emergency transports could have involved overcharging the government. That, he said, would represent millions of dollars in overcharges. The suit contends that LifeStar offices in New York, Maryland, Alabama and New Jersey all regularly inflated their billings to the federal government. Mahany said he doesn't know if LifeStar offices in other states acted similarly. Ralston worked as an EMT from 2003-2005 and was promoted to shift supervisor until he left the company in 2009, the suit says. Tisdale joined the company in 2006 and left in 2011, it says. LifeStar has eight ambulances licensed in New Jersey, according to the state Department of Health. Its corporate web site says it operates 461 ambulances and other rescue vehicles in a number of states. Altogether, Falck operates more than 800 ambulances throughout the United States. Officials at the Center for Medicare and Medicaid Services have been concerned about ambulance companies overcharging in New Jersey and other states for non-emergency services, and so it began rejecting more reimbursement requests beginning in December, 2014. The rejections have resulted in 20 ambulance companies in New Jersey going out of business as of Dec. 1, according to the state Department of Health.